Dr. Pan is currently a Senior Research Scientist and the Program Lead of Colloid and Interface program in the Center for Integrated Petroleum Research, College of Petroleum Engineering & Geoscience, King Fahd University of Petroleum and Minerals. Prior to joining KFUPM, he was a Professor (2016-2018), Associate Professor (2011-2016) and Assistant Professor (2006-2011) in the College of Engineering and the Department of Physics and Astronomy at the University of Georgia, Athens, Georgia, USA. He was a Research Associate (2002-2003), Guest Scientist (2003-2005) and Staff Scientist (2005-2006) in the Chemical Science Division and the Center for Nanophase Materials Science at the Oak Ridge National Laboratory, Oak Ridge, Tennessee, USA. 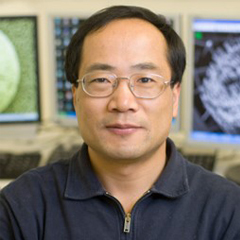 He conducted postdoctoral research at Georgia Institute of Technology (Atlanta, Georgia, USA) in 2000-2001, City University of Hong Kong (Hong Kong, China) in 1999, and Institute of Physics, Chinese Academy of Sciences (Beijing, China) in 1997-1999. Ph.D. in Materials Science & Engineering, Northwestern Polytechnic University, Xi’an, China, 1997. M.S. in Materials Science & Engineering, Shandong University, Jinan, China, 1993. B.S. in Materials Science & Engineering, Shandong University, Jinan, China, 1990. Synthesis, characterization, and properties of nanomaterials including nanoparticles, carbon nanotubes, nanowires, nanobelts, and graphene. Design, fabrication and spectral study of new persistent luminescent materials including near-infrared (700-950 nm), short-wave infrared (950-1700 nm), and ultraviolet (200-400 nm) persistent phosphors. Applications of functional materials in solid-state lighting, night and daytime identification, solar energy, and crude oil detection. Development of new physical property measurement techniques for one-dimensional nanostructures. Y.J. Liang, F. Liu, Y.F. Chen, X.J. Wang, K.N. Sun, Z.W. Pan, “New function of Yb3+ ion as an efficient emitter for persistent luminescence in the short-wave infrared”, Light: Science and Applications 5, e16124 (2016). Y.J. Chuang, F. Liu, M.Y. Kanj, M.E. Poitzsch, W. Wang, Z.W. Pan, “Ultra-sensitive in-situ detection of novel near-infrared persistent luminescent tracer nanoagents in crude oil-water mixtures”, Scientific Reports 6, 27993 (2016). F. Liu, Y.J. Liang, Z.W. Pan, “Detection of upconverted persistent luminescence in the near infrared emitted by Zn3Ga2GeO8:Cr3+,Yb3+,Er3+ phosphor”, Physical Review Letters 113, 177401 (2014). F. Liu, R.S. Meltzer, X.F. Li, J.D. Budai, Y.-S. Chen, Z.W. Pan, “New localized/delocalized emitting state of Eu2+ in orange-emitting hexagonal EuAl2O4”, Scientific Reports 4, 7101 (2014). Z.W. Pan, S.J. Lerch, L. Xu, X.F. Li, Y.-J. Chuang, J.Y. Howe, S.M. Mahurin, S. Dai, M. Hildebrand, “Electronically transparent graphene replica of diatoms: a new technique for the investigation of frustule morphology”, Scientific Reports 4, 6117 (2014). F. Liu, W.Z. Yan, Y.J. Chuang, Z.P. Zhen, J. Xie, Z.W. Pan, “Photostimulated near-infrared persistent luminescence as a new optical read-out from Cr3+-doped LiGa5O8”, Scientific Reports 3: 1554 (2013). X.F. Li, J.D. Budai, F. Liu, J.Y. Howe, J.H. Zhang, X.J. Wang, Z.J. Gu, C.J. Sun, R.S. Meltzer, Z.W. Pan, “New yellow Ba0.93Eu0.07Al2O4 phosphor for warm-white light-emitting diodes through single-emitting-center-conversion”, Light: Science & Application, 2, e50 (2013). Z.W. Pan, Y.Y. Lu, F. Liu, “Sunlight-activated near-infrared long-persistent luminescence from Cr3+-doped zinc gallogermanates”, Nature Materials 11, 58-63 (2012). Z.W. Pan, Z.R. Dai, Z.L. Wang, “Nanobelts of semiconducting oxides”, Science 291, 1947-1949 (2001). Research Award, College of Engineering, University of Georgia (2014). Applied Spectroscopy William F. Meggers Award (2011). US National Science Foundation CAREER Award (2010). Second Class Award in Natural Science in China (2002) for the contribution in carbon nanotube research. First Class Award in Natural Science in Chinese Academy of Sciences (2001) for the contribution in carbon nanotube research.